...that Jason Jones can be seen naked in an easter egg in Halo 3? Ivanoff Station - designation ONIRF IS-004920//001-54 - is a UNSC orbital research facility stationed in an asteroid field near Installation 03. It was built after the Office of Naval Intelligence discovered the location of the Installation shortly before the end of the Human-Covenant War. After examining the Floral Express's flight records, and finding a possible Halo installation in the Khaphrae system, ONI contacted and redirected pioneer teams to Khaphrae. Soon after confirming it was Installation 03, the teams attempted to find and secure the installation's Library to recover the activation index. Since Earth was under attack at the time, the teams could not return home, and they did not have the force of arms to remain on the ring, the teams settled in for a long habitation in a makeshift orbital base which they named Ivanoff Station. Shortly after the end of the war Ivanoff was expanded into a permanent UNSC facility. The facility maintained a small fleet of Pelicans and Darters to transport personnel and cargo between the ring and station, protected by squadrons of F-41 Broadsword fighters. In March 2553, Dr. Catherine Halsey was indefinitely detained here by Admiral Margaret Parangosky, as retribution for lying to her about the creation and deployment of flash clones during the SPARTAN-II Program's early phases. Catherine Halsey was later allowed to work on the UNSC Infinity, although she was transferred back to the station after finishing. However, she was relocated off the station at some point and was later taken back aboard the Infinity in early 2558. The Office of Naval Intelligence maintained an illegal black site on the station, unbeknownst to even the station's crew. This black site imprisoned scientists and technicians from throughout the the UEG, set to work on ethically-dubious research projects. The ONI facility also maintained a top-of-the-line superluminal communications system, and laboratories and workshops for the study of several objects removed from Installation 03 to Ivanoff Station, including the ring's Activation Index and the Composer - a machine capable of converting living beings into digital form. As a result of an accident with the Composer, in which several scientists studying the artifact were digitized, the UNSC discovered the coordinates to Requiem. Despite being a research station, Ivanoff had MAC defense systems and F-41 Broadsword fighters for defense against intruders, rogue asteroids and the occasional errant Sentinel, with at least three kept on site at all times. They maintained at least three F-41 Exoatmospheric Multirole Strike Fighters on site at all times. It possessed seven excavation-grade HAVOK tactical nuclear weapons. Searching for the Composer after being revived on Requiem, the Didact traveled to the station and attacked it with Covenant forces loyal to him. Despite the efforts of the Master Chief who had hitched a ride on a Lich, the Didact succeeded in getting the Composer and fired it at Ivanoff Station, digitizing everyone except the Master Chief who had an immunity to the weapon activated in him earlier by the Librarian. With everyone in the station dead and the Didact leaving, the Master Chief abandoned the station in one of its F-41 Broadsword fighters armed with one of the station's excavation-grade HAVOK tactical nuclear weapons in hopes of stopping the Didact from doing the same to Earth. With the help of the UNSC Infinity, the Master Chief succeeded in destroying Mantle's Approach and the Composer, but not before the city of New Phoenix was composed like the station. 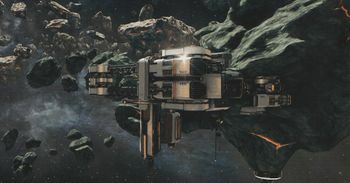 In the aftermath of the Raid on Ivanoff Station, a handful of the Ivanoff's personnel managed to escape into the nearby asteroid field and were later saved by search and rescue teams. The station is currently active, as of 2558. By October of that year, Installation 03's Activation Index had been moved by ONI from Ivanoff to an undisclosed location at some point following the ring's disappearance during the Mission to Installation 03 a few days after the station's attack. Concept art of Ivanoff Station for Halo 4. Concept art of the station's hangar bay, exterior view. Concept art of the station's hangar bay, interior view. Concept art of Ivanoff's observation deck. Concept art of a corridor inside the station. Early concept art of the Composer, resting inside Ivanoff. Concept art of the Mantle's Approach, laying siege to the station. View of Ivanoff Station through a Type-56 Lich's viewscreen. In-game view of Ivanoff station. A Broadsword docked inside the station. Ivanoff Station in Halo: Escalation. Ivanoff Station in Hunt the Signal.